Probably one of the strangest ironies in the American Church today is how every single year, we readily celebrate Resurrection Day, the time when Jesus Christ died on the cross and rose again from the grave to forgive us of all our sins, but when we do, we neither call it Resurrection Day nor celebrate it for what it’s intended to be. Rather, we call it Easter and act like it has nothing to do with Jesus Christ dying on the cross for the sins of humanity, but rather it’s about us getting a big ol’ bag of candy from some mythical egg laying bunny. That’s not only strange and detrimental to us, but I’d say God’s not too pleased with it. 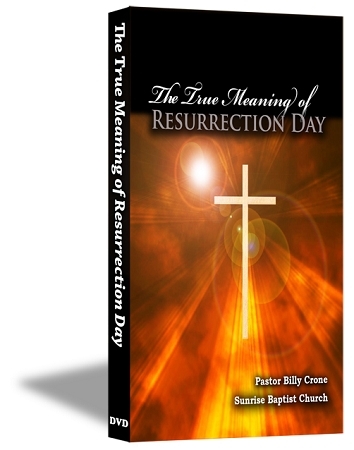 Therefore, this study, The True Meaning of Resurrection Day, shows us how this annual Christian holiday is supposed to remind us of the wonderful truth that because Jesus rose again from the grave, there’s Forgiveness for the Fractured Soul, Healing for the Brokenhearted, and Hope for a Hopeless World. This is the message our world so desperately needs to hear. Because our Redeemer lives, all God’s children will make it across the finish line called heaven. That’s the True Meaning of Resurrection Day!